Jane Lake Makes a Mistake: Jane Lake and Scientology! When I first came to New York, I was approached by Scientologists to take their "stress test". Being new to NY, I figured why not. After taking the test, they recommended that I attend a seminar and buy some materials. Having no money, I passed. Is is a scam? I think to some extent yes because they prey on people in need to fund their organization. 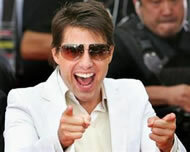 And although I do not support the rants of Tom Cruise, you have to admit he has done pretty well for himself. He is successful, healthy, and praises Scientology for it all. As do others. I think it comes down to some things work for some people and not for others. It is a technique, a gimmick if you will. Not much different than a day timer. It doesn't work for me, and never will. I do believe positive thinking changes your health and outlook. I do believe it is important to be proactive in your life to effect change. But if you don't believe something will work, it tends to fail, and vice versa. That is why placebos work. I think things like Scientology work for those who believe it will and make it work. For everyone else, I recommend Ibuprofen. It comes down to what you consider 'working' to be. I know people who are Scientologists who are not happy. Scientology just says that these people haven't gotten rid of enough 'Thetans'. Unfortunately, in Scientology, getting rid of Thetans means paying money. This kind of thing makes me deeply suspicious. I have to wonder about the space aliens that live invisably all around and in us. Hubbard started his adulthood as a con. He may the best in the world. I used to work across the road from scientology headquarters in Sydney. I often received their literature, which I read, because books are too expensive to read on the train *every* day. What shocked me was how utterly mundane most of it was. It offered me amazing insights along the lines of: why it is important to take care of my teeth or get along with my parents and try hard at work. I was quite offended that these smiling, neatly dressed kidlets thought I was so desperately in need of this advice. I might be an atheist, but at least Jesus wasn't boring. I have never been quite sure if Scientology is bad philosophy or simply a "skillfull means" for resolving the chicken/egg conundrum. Self caused problems can so easily be confused with externally caused problems that one can chase one's tail around the Mulberry Tree for years and never escape the contradiction. I may question all religions, it just seems Tom and his whacky religion is a giant scam. a lesser version of the almighty aliens. But I like the idea: "If you do not wished to be judged then do nothing and you wont be judged." a loose Lynn translation of a Hubbard Philosphy. When I lived in Minneapolis, I had just gotten there and I was bored. I took said test and I was told I was depressed and full of stress...and it was not my fault. AND if I bought some book I could heal myself. I think if they knew the power of true healing, they should give it to me for free. Or atleast give me a cookie while I take the test. I told them I was late for my movie (Batman Begins opened that day) and the man then looked at me like I just slapped Tom Cruise in the face with a Bible. He gathered the papers and said I will continue to be depressed...right, and he will continue to have bad sales!